An easy way to screen your own child for CI is to go to prepare an informal reading test on your computer. Cut and paste some age-appropriate text into a word processor. Set the font size to 14 or 16 point. Print the sheet and tape it to a blank wall or an uncluttered refrigerator door. Ideally, the text should be at least 50 words long. Have your child sit or stand eye-level with the text at least 5 feet away and have them read it out loud. Do they stumble over words? Do they have to sound out most of the words? Do they take a long time to read everything? If so, there’s a good possibility that CI is not the cause of the underachievement and vision therapy will not help. If, on the other hand, they have no problems reading the text from a distance, then try reading normally from a book. Ask your child how it feels to read something up close. If they complain about blurriness or or even that words are jumping around, it may be time to make an appointment with a developmental optometrist to discuss convergence insufficiency treatment. The Center for Disease Control (CDC) reports “approximately 11% of children 4-17 years of age (6.4 million) have been diagnosed with ADHD as of 2011.” That staggering number has risen at a rate of about 5% each year for almost a decade. Where a family lives seems to effect the likelihood that ADHD is diagnosed and/or medicated. 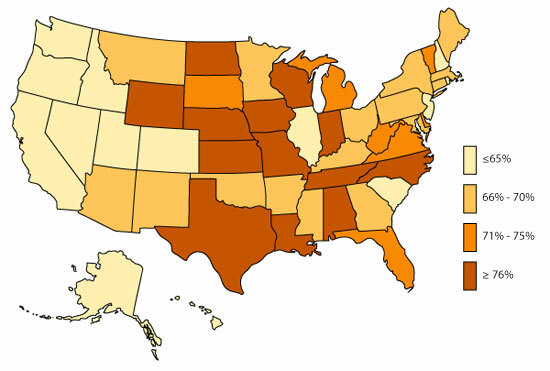 Nevada leads the country with the lowest prevalence of ADHD diagnoses for children between the ages of 4 to 17. On the other hand, Louisiana leads the country by medicating more than one in ten children for ADHD. ADHD is a real medical issue, but, unfortunately, we do not know what precisely causes it. No single test exists to say that yes, a child absolutely has ADHD. Instead, doctors rely on a checklist of behaviors. Consider the diagnostic criteria for ADHD and consider how easy a 15-minute doctor visit can result in such a label. NOTE: Not all the following criteria must be met in order for a diagnosis to be made; but the symptoms *must* be present in at least 2 different settings, such as school and home. Not everyone believes that ADHD is truly growing at the reported rate. Sure, the diagnoses are increasing in number and more and more children are being medicated – but some people wonder: Are we dealing with a chronic misdiagnosing problem? We know that some of the classic symptoms used to diagnose ADHD can be caused by other issues. Executive Functioning Disorder leads to an array of disorganization, which can cause a child to lose track of completing tasks. Profoundly gifted children often have a hyper-focus on topics of interest, which allows them to be easily distracted and not hear when they are being spoken to. Sports-related concussions (diagnosed or not) can result in a mild traumatic brain injury, which will leave a person forgetful in everyday activities. Recently, a resident doctor from inner-city Baltimore made an observation while working at Johns Hopkins Hospital. [C]hildren diagnosed with ADHD also experienced markedly higher levels of poverty, divorce, violence, and family substance abuse. Those who endured four or more adverse childhood events were three times more likely to use ADHD medication. Now, just because two factors seem to be related, we cannot jump to the conclusion that one factor automatically causes the other to happen. Instead, we have to try to answer the old chicken-or-the-egg question. Does ADHD and poorly managed behaviors lead adults to be less successful in their jobs, wind up living in poverty, and have children who also suffer from ADHD? Or, is it possible that living in poverty can somehow lead to the development of ADHD? Dr. Nicole Brown, the Hopkins’ resident, thought it worthy to ask an entirely different question. She began with the astute observation that children living in poverty, surrounded by street and/or home violence, are in fact, suffering from a form of post-traumatic stress. Is it possible, then, that a segment of children are being misdiagnosed with ADHD because many of their PTSD behaviors look so much like inattention? Nightmares, flashbacks, and recurring intrusive memories, for example, can cause extreme sleep problems. Even just one night’s lack of a good sleep can lead to distractibility and other problems. Compound that by weeks or months of restless sleep and it’s easy to see why children with PTSD have problems concentrating in a classroom. We all dream of finding a quick fix for off-task behaviors. (If we’re truly honest with ourselves, some distractible kids are just downright annoying.) But, as parents and educational professionals, we owe it to our students to look past the behaviors we want to wish away and look deeply for what truly may be happening within a child. Medicating the manifesting behavior may help a child become a more compliant student. But, looking deeply and addressing the core issue within a child will help them become a more functional and self-reliant human being. Do you think it’s possible that PTSD is mistaken for ADHD in some children?